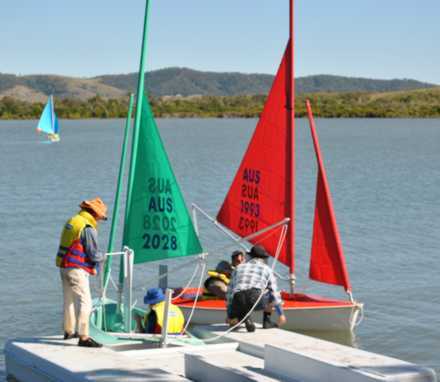 Sailability Capricornia is part of a non-profit world wide organisation run entirely by volunteers. Our goal is to make sailing accessible to people of all level of abilities. 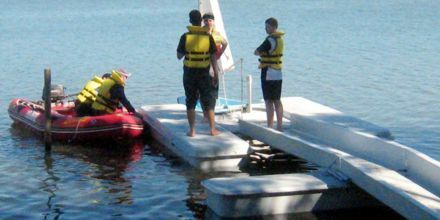 We use Access Sailing Dinghies which are purpose-designed dinghies suitable for disabled sailing. We also use Hobie Adventure Island trimarans. Both are available with seating for 2 people, so each sailor is accompanied by a skilled skipper. Two of our fleet of six Access Dinghies. They are very stable and virtually impossible to capsize having a removable weighted centreboard. These boats are easy to operate and are steered using a joystick instead of a tiller. If you want to go left, you simply move the joystick left. More photos and a short video taken on one of our sail days can be seen on the gallery page. suitable footwear. Covered in shoes with socks that the sailor doesn’t mind getting wet. The banks of the Causeway Lake are a little rocky in places. We provide approved life jackets for all sailors. South side of the Causeway Lake, near the Coolwaters Holiday Village, on the Capricorn Coast. You can find a map here. The coloured sails of our boats are easy to see once you get down there. Currently twice a month on the 1st and 3rd Tuesdays. We are aiming towards weekly sailing in the future. Sailing times start at 9:30 a.m. and finish about 12.30 p.m.
No charge for your first sail day. Try before you buy! For casual sailors we ask for a $8 donation per person, per sail.